In the miserable cold and wet weather of winter, fun in the sun can feel a million miles away. But if you’re looking to swap your jumper and coat for swimwear and sunglasses (at all times of the year), it can be difficult to know where in the world to start looking. 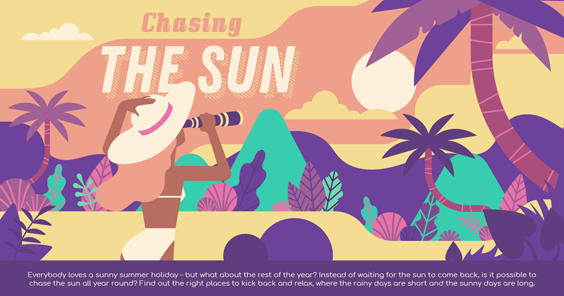 Sunshine experts Oliver’s Travels have found the warmest, sunniest hotspots worldwide for taking a trip every week of the year – whether you’re looking to make the most of your summer or escape the frost. 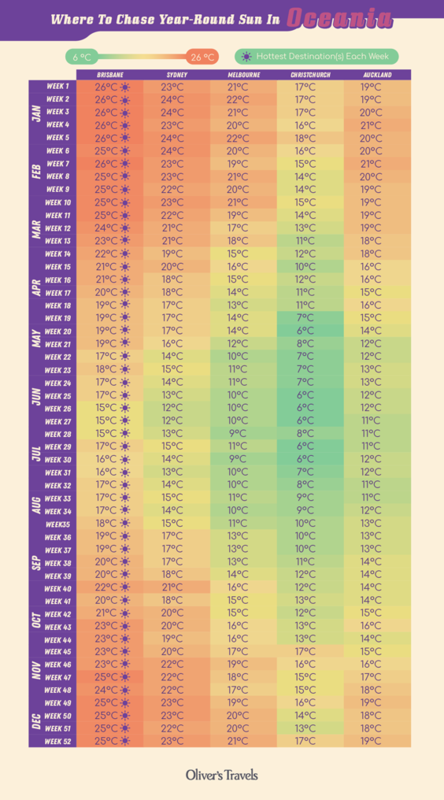 No matter what time of year, there are always some locations that are going to be a little bit warmer than the others. If you really want hot and sunny all year, your best bet is to travel to Dubai, where the minimum temperature throughout the year is still a pleasant 21°C and the highest can be a meltingly hot 38°C. Europe – Europe’s most consistently warm place, Rome’s great for culture, and sun, nearly year round. 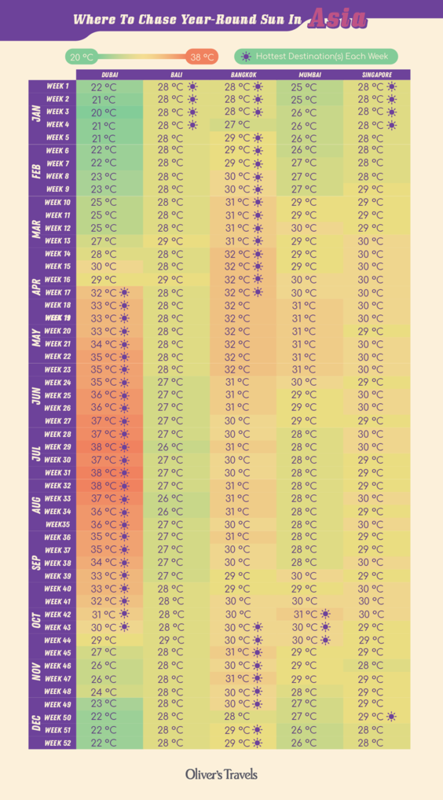 Temperatures hit yearly highs of an average of 30°C in the Italian capital, though if you’re more into tapas than pizza then Barcelona isn’t far behind in temperature for most of the year hitting an average of 26°C in summer! The Americas – While Las Vegas is the location for sweltering highs during the summer, with averages of 38°C not uncommon, in the winter you’d be better off heading to sunny Honolulu. 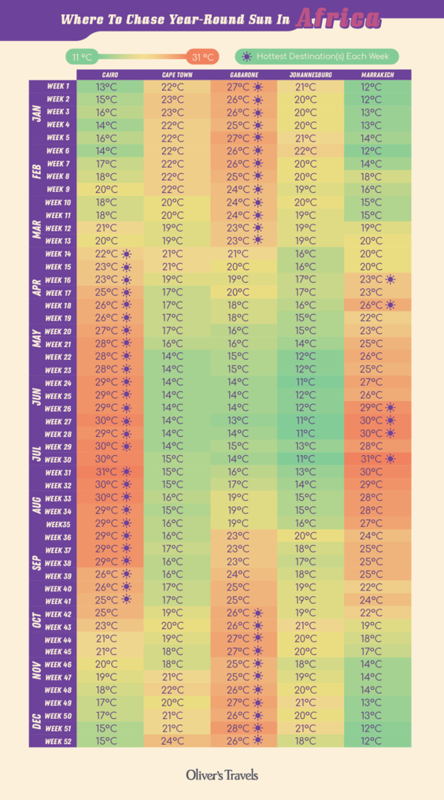 December weather in picturesque Hawaii ranges from 24-25°C, and the consistent destination doesn’t drop any lower throughout the year either. Africa – For winter travellers, Gabarone is the ideal place to catch some African rays, where temperatures hit their peak at 28°C. However, for summer holidayers Cairo is the place to be, reaching 31°C on average, making it the sunniest option from April to October. Oceana – Without compare in Oceania, Brisbane is the continent’s hottest and sunniest city throughout the year. 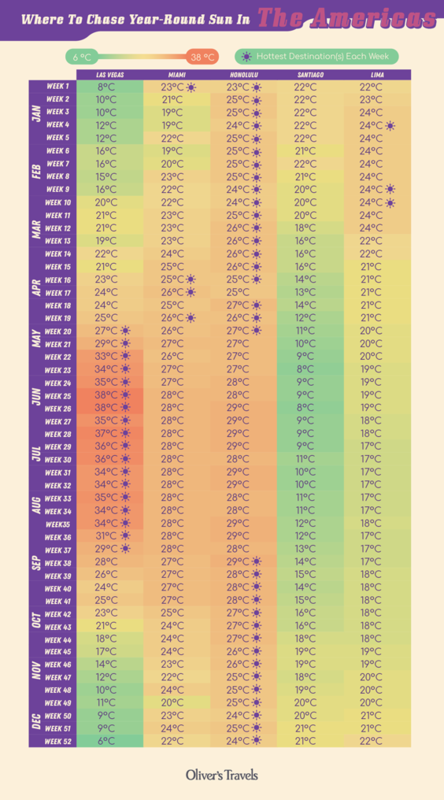 Beating out Sydney, Melbourne and Fiji, Brisbane’s temperatures range from a minimum of 15°C in July through to comfortably sunny averages of 26°C in January and December. In fact, there isn’t a single week of the year when another Oceanic location overtakes Brisbane in temperature! While London can have the occasional sunny day during the summer, or many sunny days in the rare case of last summer, it’s a much more familiar scene to see the UK capital overcast with grey clouds and boasting no more than temperatures in the mid-teens year round. 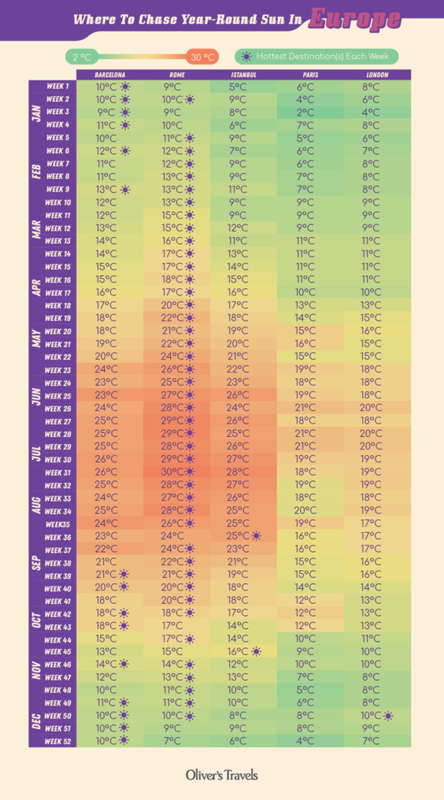 On average, London peaks in the 26th-29th weeks of the year – June to July – where it hits an average of 20°C. That’s lower than Dubai, Bali, Bangkok, Mumbai, or Singapore – even at their coldest! Needless to say, if you’re seeking the sun, the UK is far from the ideal hotspot. A representative from Oliver’s Travels said: “Everyone enjoys a bit of sun to boost their mood and work on their tan, but it can be a real disappointment to arrive on holiday and discover there’s no sun there either.